Loupedeck+, the customizable post-production controller, has added Final Cut Pro X and Adobe Audition to the list of supported programs. Last year alone, the Loupedeck+ gained support for Adobe Premiere Pro CC, Adobe After Effects CC, Adobe Photoshop CC, Capture One and Skylum Aurora HDR. Now, the device is even more capable with support for Apple's professional video editing program, Final Cut Pro X, and Adobe's audio editing program Audition. 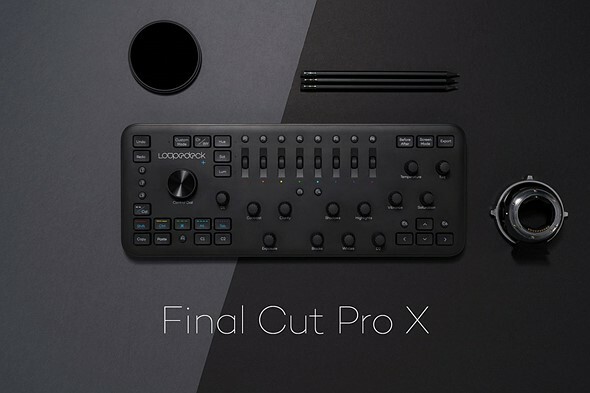 With Final Cut Pro X, the Loupedeck is now able to color grade and color correct with its HSL color wheels, adjust/trim clips and scrub through the video timeline. The other keys and dials on the keyboard can also be customized to control more than 400+ additional functions and assign various keyboard shortcuts. Loupedeck+ configurations can also be imported and exported for syncing across multiple units. In Adobe Audition, the Loupedeck+ can manage single track and multitrack projects with the ability to trim/nudge audio clips, add fades and effects with the click of a button, and adjust the volume for different channels with the scroll wheels. The software update can be installed directly from the Loupedeck program if you already have it installed on your computer. Otherwise, Loupedeck version 2.6 can be downloaded from the Loupedeck website. The Loupedeck+ controller unit is available from Loupedeck for $249 / 229€ with free worldwide shipping. Loupedeck also has a YouTube channel with various tutorials showing how to make the most of the Loupedeck+ controller.